Bay Area cupcake shop donates proceeds to tornado relief efforts. Some Bay Area businesses are taking action to help provide relief for Oklahoma tornado victims. Charles Nelson, co-founder of Sprinkles Cupcakes in Palo Alto, is an Oklahoma native who hopes to raise several thousand dollars for his home state. 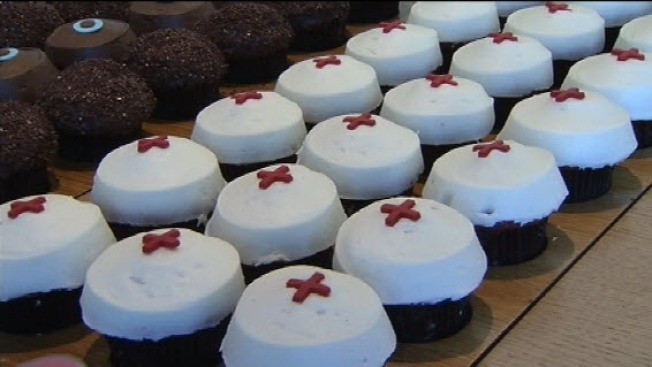 The cupcake shop is selling “Red Cross Red Velvet Cupcakes” until 9 p.m. on Wednesday. All proceeds will go to the Red Cross. The white-frosted cupcakes decorated with red crosses on top are priced at $3.50 each and $39 per dozen. The company’s past recovery efforts have generated as much as $55,000. The San Jose Sharks Foundation also contributed to relief efforts by collecting more than $5,500 in donations at Tuesday’s game. Donations will be accepted again at Sunday’s game at HP Pavilion.